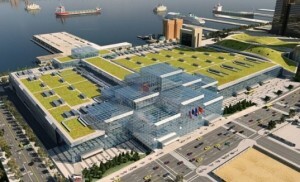 New York’s Javits Center has achieved LEED Silver certification from the U.S. Green Building Council. Convention Center Operating Corporation president and CEO Alan Steel announced the certification was awarded following the completion of a massive renovation. The green roof is a haven for birds and an eco-feature that’s saving money. Located on Manhattan’s West Side, the Javits Center is considered the busiest convention center in the United States, supporting more than 17,000 jobs and generating up to $1.8 billion in economic activity for the Empire State. Led by the New York Convention Center Development Corporation, FXFOWLE, Epstein and Tishman Construction, an AECOM Company, the renovation has reduced the building’s energy consumption by 26 percent, saving energy costs and improving the area’s quality of life. The building’s signature feature — a nearly seven-acre green roof — is the country’s second largest of its kind and has become a sanctuary for area wildlife, including hundreds of bats, birds and bees. 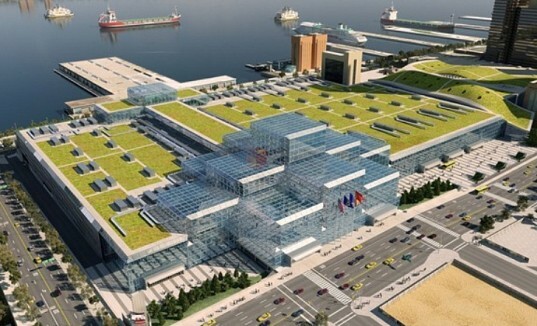 “The Javits Center has become a model of sustainability for buildings throughout the region, and I would like to thank the U.S. Green Building Council for recognizing such an achievement,” said Steel. According to Bruce Fowle, founding principal, FXFOWLE, the Javits Center’s original building was ahead of its time technologically, but it was fraught with problems. “Our goal was to retain the integrity and vision of the original design while capitalizing on opportunities to reinvent, revitalize, and sustain this dynamic, world-class facility,” said Fowle. Funded by a public-private partnership, the $463 million renovation project provided a significant upgrade to the Javits Center’s infrastructure, improving the aesthetics of the facility while enhancing its overall operations and services to customers. More than 100 energy-efficient HVAC units were installed, as well as 300,000 square feet of new terrazzo, a new food court in the Crystal Palace, energy-efficient lighting and a dozen renovated restrooms. During the five-year renovation project that was completed in 2014, the Javits Center remained fully open at all times as staff and construction managers worked together to coordinate construction operations around the busy event schedule. With the installation of both new and upgraded fixtures, the Javits Center achieves a 33 percent reduction in Regulated Potable Water annually, per LEED 2.2. That amounts to 2.9 million gallons of water saved annually. These savings equate to drinking water for up to 1,000 people for the duration of one year. 77 percent of construction waste was diverted from the landfill, per LEED 2.2. Of 9,865 tons of waste generated, 7,567 tons were diverted. The curtain wall was replaced with a combination of solid stainless steel panels and glass that reduced the reflectivity from 35 to eight percent and included a ceramic frit pattern that reduced solar gain while creating a visual obstruction for the birds. With more than 6,000 new, bird-friendly glass panels installed, bird collisions decreased by 90 percent, allowing the building to transform into a unique habitat for area wildlife atop its green roof. As a result, the building has received accolades from the National Audubon Society, New York City Audubon, the U.S. Environmental Protection Agency and the Building Owners and Managers Association. 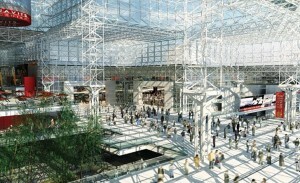 Known as the “Marketplace for the World,” the Javits Center was originally designed by I.M. Pei & Partners and opened in 1986. The facility has 840,000 s/f of flexible exhibition space, 102 meeting rooms and four banquet halls.